Three Brooklyn men accused of planning to join Islamic State in Syria have been arrested by authorities in the United States. Had they failed to join the extremist group, the men allegedly planned to return to the US and wage attacks there. plans to assassinate President Barack Obama, court documents stated, according to CNN. Still, the man added that he "currently does not have the means or an imminent plan to do so." The men — Abdurasul Hasanovich Juraboev, also known as “Abdulloh Ibn Hasan,” Akhror Saidakhmetov and Abror Habibov, according to an affidavit — were arrested overnight Tuesday evening and named in a criminal complaint unsealed in the Eastern District of New York on Wednesday. Juraboev, 24, Saidakhmetov, 19, and Habibov, 30, are all residents of Brooklyn. Saidakhmetov is a Kazakh national while Habibov and Juraboev are Uzbek nationals. All three face charges of attempt and conspiracy to provide material support to the group calling itself Islamic State, also known as ISIS or ISIL. 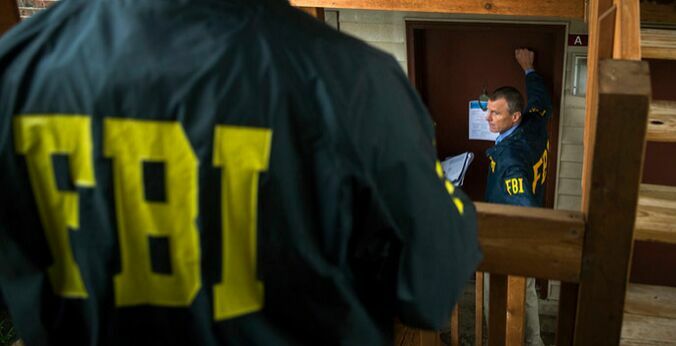 "The defendants looked to join the Islamic State of Iraq and the Levant by flying to Turkey in a vain attempt to evade detection," said Diego Rodriguez, the Federal Bureau of Investigation assistant director in charge. The group first came under suspicion in August 2014, when Juroboev posted on an Uzbek-language website common for spreading ideology associated with Islamic State. Juraboev and Saidakhmetov planned to go to Turkey, then Syria, "for the purpose of waging jihad on behalf of ISIL," the US Department of Justice said in a statement. Saidakhmetov was arrested at JFK airport, where he planned to board a flight to Istanbul, Turkey, according to a statement published Wednesday by the Justice Department. Juraboev allegedly purchased a ticket to fly to Istanbul next month and was apprehended in New York, and Habibov — accused of helping to pay for Saidakhmetov's travel, according to the DOJ — was apprehended in Florida. Juraboev was allegedly prepared to "engage an act of terrorism" in the US if ordered by Islamic State, the Justice Dept. claimed. Saidakhmetov “intended to commit such an act if unable to travel abroad to join ISIL." “The flow of foreign fighters to Syria represents an evolving threat to our country and our allies," said US Attorney for the Eastern District of New York Loretta Lynch, soon to be the US Attorney General. 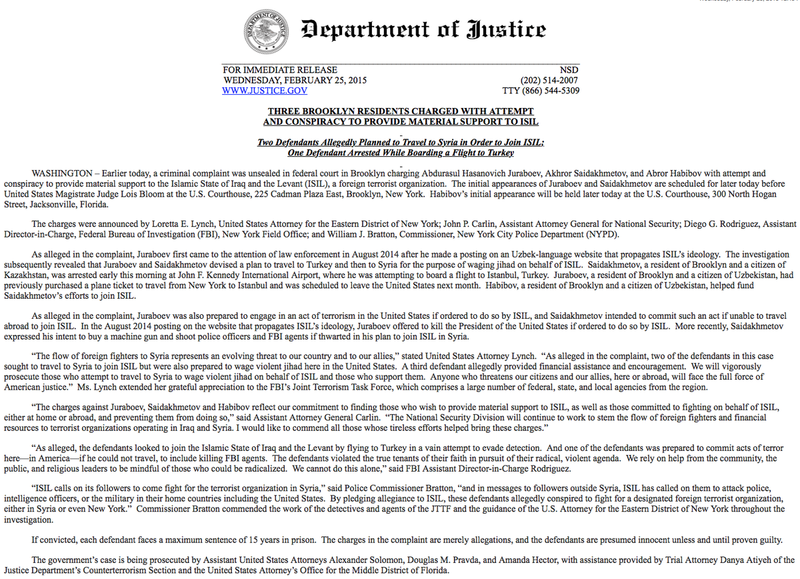 "As alleged in the complaint, two of the defendants in this case sought to travel to Syria to join ISIL but were also prepare to wage violent jihad here in the United States. A third defendant allegedly provided financial assistance and encouragement. We will vigorously prosecute those who attempt to travel to Syria to wage violent jihad on behalf of ISIL and those who support them. Anyone who threatens our citizens and our allies, here and abroad, will face the full force of American justice."